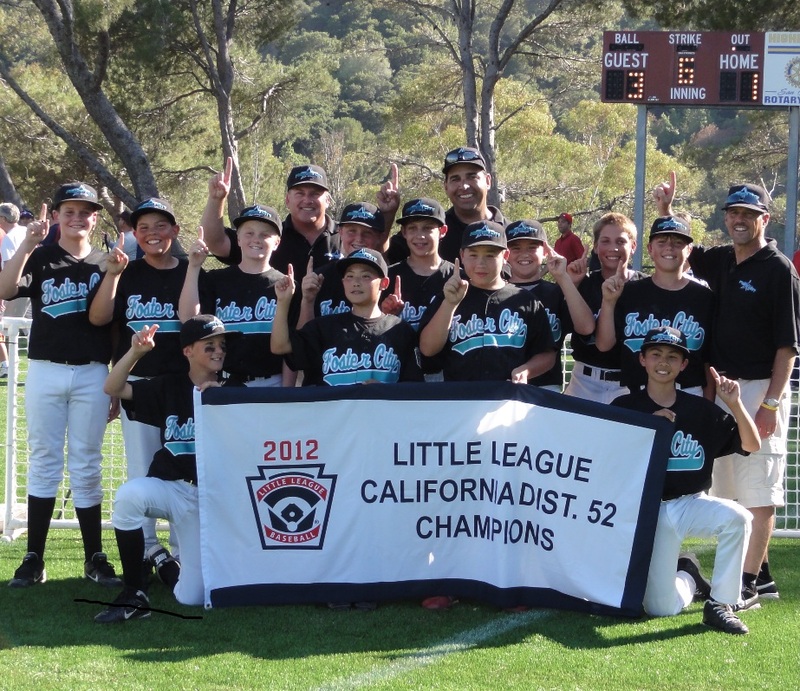 Foster City Little League wants to thank all the players, coaches, parents and volunteers for a wonderful 2012 season. Congratulations to the 2012 FCLL All Star Team players listed below! All teams and game results are below. District 11/12 Team are 2012 Champions! 11/12 District Team - 2012 Champions! Wednesday July 11: Won 3-1 over Hillsborough to WIN Championship! San Mateo Daily Journal Article "New Champ Crowned"
San Mateo Daily Journal Article "Fresh Faces Represent District 52"
Foster City came in 2nd Place in Section 3 which is a huge accomplishment. Congratulations to the boys and coaches for a great season! Follow the Northern California Tournament Bracket below. For the first time in 20 years the Foster City District 11/12 Team won the 18 team tournament by beating Hillsborough 3-1 in the championship game. The team went 5-0 in the tournament and allowed only 6 runs. The District 11/12 Team would like to thank all the players and coaches for the many hours of hard work along with the parents and fans for their support. Without a dedication by all to develop our boys throughout the years, this championship result would not be possible. We're proud of the team's accomplishment and the first Foster City District Title since 1992! Monday June 25: Lost 3-2 against San Mateo National who advances to the championship game. Tuesday June 26 was the championship game and Pacifica American beat San Mateo National 4-3 to win the Super Bowl Championship. It was a great effort by our Majors Super bowl players who gave 100% during the tournament, played some good ball and represented Foster City very well. Congratulations to all the boys who won 2 games and played well throughout the tournament. You represented Foster City Little League very well and should be very proud of your efforts as we are of your team! 9/10 District Team - Finish 2nd Place! Wednesday July 11: Lost 5-3 to Pacifica American in Championship Game to Finish in 2nd Place! Congratulations to the Foster City 9/10 Team for making it to the Championship Game and coming in 2nd place out of 17 District teams! We're very proud of your terrific accomplishment in the tournament! Thank you for the fan and parent support. Congratulations to an outstanding group of All Stars who represented Foster City very well. Minors Super Bowl Team are 2012 Champions! Monday June 25: Won 6-5 over Belmont-Redwood Shores to advance to the championship game on Tuesday against San Mateo American. Tuesday June 26: Won 6-4 over San Mateo American to Win Championship! Minors Super Bowl Win Championship! The Foster City Minors Super Bowl team would like to thank all the fans and supporters that came out to cheer us on and the support we got throughout the tournament. We played a very tough San Mateo Team in their own fields and you fans owned them. We out numbered the home team fans at least 3-1. The boys were thrilled to have that type of support from all of you. What a truly great city we live in to have this type of support. Thank you all. We are very proud of the boys and the effort they put out there these last two weeks. Winning a Championship is secondary to the self respect these boys earned with all their hard work, dedication and effort. Memories forever. From the coaches point of view, we are so proud of all of them. Thank you for letting us coach your boys. Congratulations to the Giants who beat the Yankees by a score of 7-6 in 7 innings to win the Championship. It was a great game! The Giants are the Regular Season Champion as well as the Tournament Champion. Congratulations to the Mudcats who beat the Grasshoppers twice to win the AAA Championship. The Mudcats beat the undefeated Grasshoppers on Saturday 9-6 to force a second championship game on Monday. In that final game, the Mudcats won 11-7. It was a great championship matchup and both games were close up to the very end.